Quite a few customers that are using Exchange Online Archiving in an Exchange Hybrid environment, where they have their primary mailboxes on-premises and the archive mailboxes in Exchange Online. This makes a very flexible solution and a perfect start to utilize but not go all in to the cloud. Just as in a “regular” hybrid environment, you have the possibility to on and offboard the archive mailboxes from and to the on-premises Exchange server. While testing offboarding of an archive mailbox a while ago, I ran in to an interesting error related to the ExchangeGuid attribute. Multiple objects with the same Guid, could that really be true? Investigating further confirmed the error message. 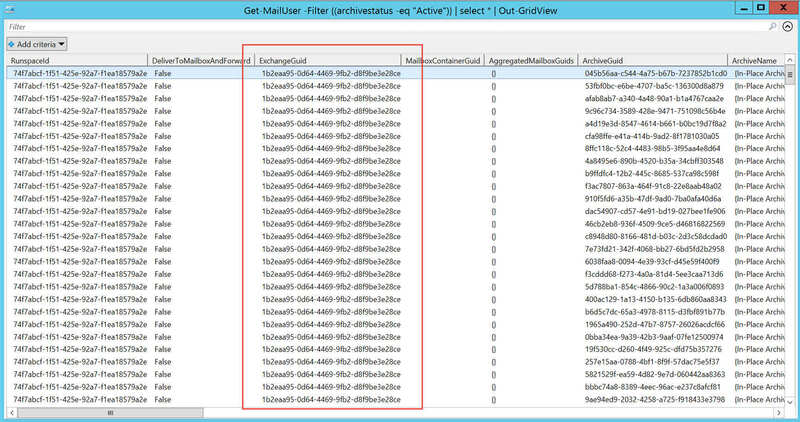 All users in Exchange Online/Office365 had the same value in the ExchangeGuid attribute, even if they didn’t have an archive mailbox. The following kb describes a similiar problem in a hybrid environment, but the exact solution could not be applied in my scenario since the RemoteMailbox-cmdlets isn’t working in EOA scenarios. It do however state that in order for a successful move, the ExchangeGuid should be the same on-premises as in the cloud. After doing the change on one user as below the move started and completed successfully. I still have a MS support case open regarding how the attribute ended up the same on all users and will update the post when we have identified the root cause. This entry was posted in Exchange Online and tagged Exchange Online Archiving Offboarding, Exchange Online Offboarding, ExchangeGuid, Multiple objects with Guid were found on August 19, 2015 by Johan Dahlbom.